Art in the Garden: With over 30 artists exhibiting in Kiwi Gardens near Perth, this showcase of art and crafts draws over 3,000 visitors every year. June 15 and 16. Thousand Islands Wine & Food Festival. June 14 and 15. Revel in the joys of some of the province’s finest wine, beer, and food. Festival guests are invited to sample drinks from different regions, along with locally produced foods, while enjoying the relaxing ambience of Brockville. On Saturday, special guest Konrad Ejbich from CBC’s Ontario Today stops by to share some wine expertise. A complimentary shuttle service is offered for local hotel guests during festival hours. $10. Brockville Memorial Centre, Magedoma Drive, Brockville, 888-251-7676, www.brockvilletourism.com. Brockville Tall Ships 1812 Tour. June 14 to 16. Thirteen ships sail into Brockville for the weekend, bringing a lot of excitement along with them. In commemoration of the War of 1812, tall ships from around the world are circulating Ontario waters this summer. Their weekend in Brockville brings musical events, a Shakespeare performance, hot air balloon rides, the Brockville Pipe Band, the Fort Wellington Cannon Display, a fireworks display and, of course, ship tours. The admission fee counts as an unlimited weekend pass for any of the 13 ships. $12. Brockville Tourism, 10 Market Street W., Brockville, 888-251-7676, www.tallshipsbrockville.com. Lambs Down Park Festival. June 15. The Canadian Co-operative Wool Growers grade and market close to three million pounds of raw wool each year, making Carleton Place the largest distribution centre for lambs’ wool in Canada. In honour of the wool industry, the town’s Business Improvement Association is hosting this free festival for the third year in a row. The day-long event features hands-on demonstrations of sheep herding (using working sheep dogs), as well as sheep shearing and wool spinning. Visitors can tour the Wool Growers’ facilities, get up close and personal with lambs and sheep at the petting zoo, and try special lamb dishes by local restaurants. Canadian Wool Growers Co-operative, 142 Franktown Rd., Carleton Place, 613-257-8049, www.downtowncarletonplace.ca. Art in the Garden. June 15 and 16. 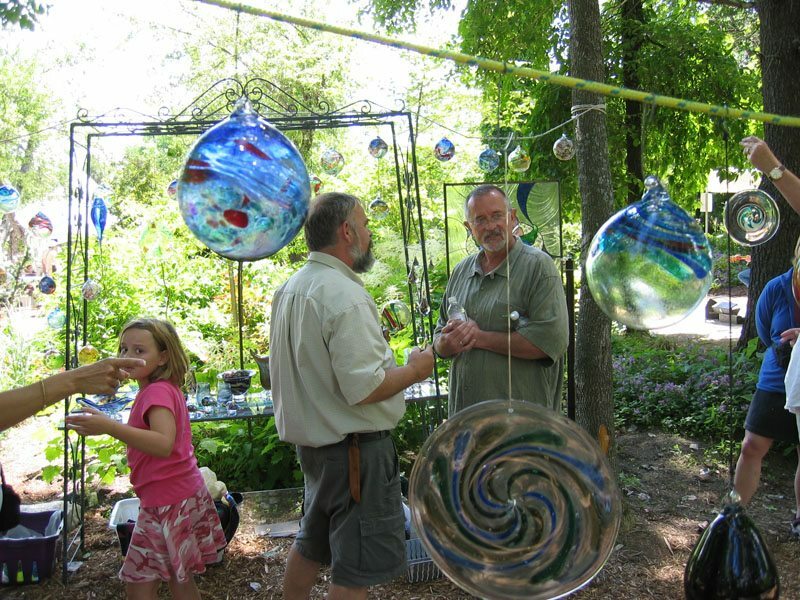 With over 30 artists exhibiting in Kiwi Gardens, this showcase of art and crafts draws over 3,000 visitors every year. Displays are set up among the expansive perennial beds and include such items as garden sculptures, obelisks, blown glass, outdoor furniture, pottery, and other pieces of unique garden art. Stay to enjoy the gardens, live music, and food as well. $5. Kiwi Gardens, 687 Harper Rd., Perth, 613-267-7384, http://www.kiwigardens.ca/. Thousand Islands Jazz and Blues Festival. June 15 to 22. In addition to the tall ships and the Wine and Food Festival, the Jazz and Blues Festival also kicks off in Brockville, providing the opportunity to wind down and relax to the soothing sounds of talented musicians. This year’s lineup includes Diana Panton, Cadence, and the Apex Jazz Band. During the Brockville Farmers Market on Saturday, June 15, River City Junction kicks off the festival with a free concert at 11 a.m. See website for admission fees. Various locations, Brockville Arts Centre, 253 King St. W., Brockville, 613-342-7122, www.brockvilleconcert.ca. Festival L’Outaouais en fête. June 21 to 24. This four-day revelry highlights francophone culture, language, and arts through a wide range of outdoor activities and events. Visitors can catch dance and vocal performances by well-known francophone artists, as well as fireworks, a parade, daily children’s entertainment, amusement rides, displays by local artisans, and a nightly bonfire. Free until 5 p.m., $13 for evening. Parc des Cèdres, rue Raoul-Roy, Gatineau (Aylmer sector), 819-684-8460, http://www.festivaloutaouaisenfete.com/. Healthy Living Festival. June 22. Lace up those running shoes in preparation for a day of free physical activities. The Smiths Falls Healthy Living Festival has something for all ages. A rock-climbing wall, an obstacle course, a bike rodeo, a bouncy castle, face painting, and buskers keep kids entertained. Adults can work up a sweat at the Cardio Kick-a-Thon and participate in various workshops, including tai chi, hip hop, dance, and piloxing. Seminars and offerings from local vendors round out the festival. 77 Beckwith St. N., Smiths Falls, 613-283-4124 ext.1114, www.healthysmithsfalls.ca. Fantastic Fibres and Quilt Show Weekend. June 22 and 23. They’re both beautiful and functional. This weekend celebrates the art of quilting at Upper Canada Village. Quilts old and new are on display throughout the village. Participate in or observe the Quilt Show Challenge, attend specialty quilt talks, and meet with other fibre artists, including spinners, weavers, and lace makers. $17, youth and seniors $14, children five and under free. 13740 County Rd. 2, Morrisburg, 800-437-2233, www.uppercanadavillage.com. 30 Barrett Chute Rd., Calabogie, 800-669-4861, calabogiecountry.com. Thousand Islands Family Ribfest. June 28 to July 1. This free weekend is packed with music, entertainment and, of course, ribs. There are also plenty of vendors, demonstrations, and a beer garden. Peruse works by local artists at the Rotary Arts and Crafts show on Saturday and Sunday. Fireworks light up the sky on Sunday evening, and a Canada Day parade keeps the party going on Monday. Gananoque Town Park, 30 King St. E., Ganonoque, 613-382-9804, www.ganribfest.com.